The rollout will see 94 per cent of premises in South Gloucestershire* connected to superfast broadband of 24Mbps and above by the end of March 2015. Once complete, nearly 100 kilometres of fibre cabling will be laid across the district, delivering over 50 new fibre cabinets. 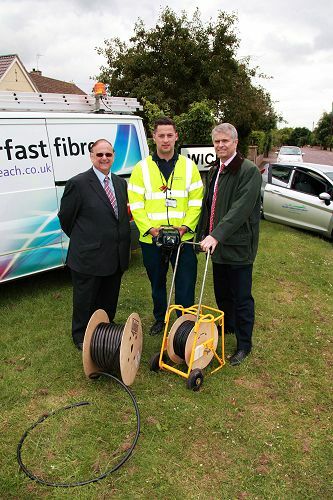 Pucklechurch and Wick are the first villages to be announced and residents and businesses will be able to order fibre broadband from spring 2014. This announcement marks the beginning of the roll out of fibre broadband by the partnership. More than 5,000 homes and businesses in South Gloucestershire will be able to connect to fibre broadband by June 2014 as the project rolls out to other areas in the district. The £35.6 million project is one of the first in the country to deliver broadband to communities and businesses thanks to a partnership between the two councils and BT, along with funding from the Government’s Broadband Delivery UK (BDUK) programme. Jack, 22, lives in Hinton, South Gloucestershire. Born and brought up in the area, he attended Sir Bernard Lovell Secondary School in Oldland Common. When he left school in 2007, Jack completed an apprenticeship in stonemasonry, qualifying in 2010. While he enjoyed the work the income was unpredictable so he looked for other opportunities. He applied for a position as an Openreach apprentice, attracted by the learning and development the scheme offers, and the promise of a full time job at the end of the two-year apprenticeship provided he achieves the necessary level at each assessment stage. Jack is due to complete his apprenticeship with Openreach, BT’s local network business, next month.